Pinterest API library is now included and integrated with the SNAP Pro for WordPress plugin. No separate installation is required. Social image-sharing site Pinterest is growing fast. Your site or blog is already posting your updates to Facebook and Twitter, so what about Pinterest? 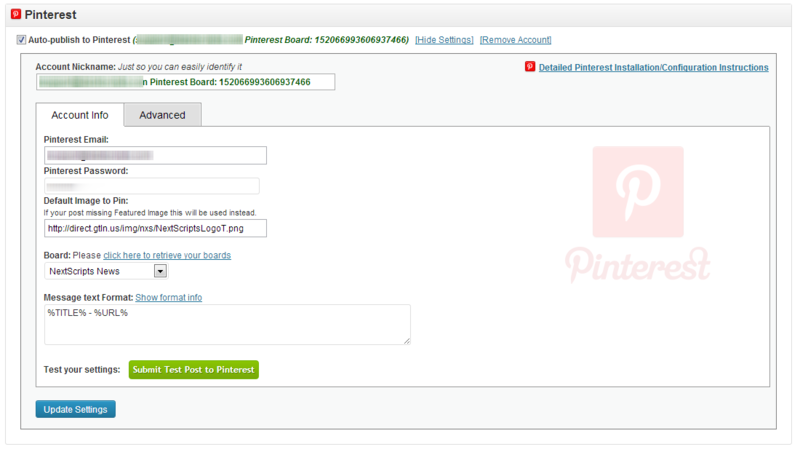 Pinterest API is not released yet, so there were no way to sync your updates around all networks including this one. Well, we did it with Google Plus, and now we did it with Pinterest as well. New Automated Posting API library from “NextScripts” is capable of automatic sharing images from your site directly to your Pinterest account. Also get a WordPress Plugin that will automatically publish all your posts to Pinterest. More complex example: Pinterest bot protection. PHP5, cURL with OpenSSL, WordPress if you would like to use plugin. – [Improvement] – Switched to new generation of automated logins. No more “cookie” files required and it can work with open_basedir set. – [BugFix] – Some Small Bug Fixes.